We’re a provider of iCOMBAT professional tactical training equipment, these tools can be essential for law enforcement crisis management training. Please visit our iCOMBAT equipment page for more information about the equipment we use. We are a iCOMBAT sales professionals please contact us about sales, rentals and other information. The iCOMBAT laser system is completely safe and allows realistic strategy and tactics in any environment. Muscle memory will not be reduced and movement will go unchanged. Don’t let unnatural safety equipment slow you down or change your skill set. 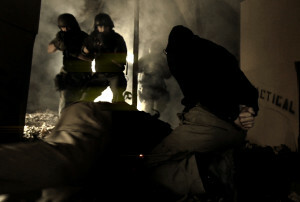 SBTactical provides iCOMBAT active shooter equipment rentals, sales and customer service. We train corporate clients and specialize in supplementing law enforcement training with equipment and logistics.